Woah! What a day. It’s been one crazy evening today. Two of the biggest Bollywood celebrities are having their wedding and post wedding celebrations, and I can’t get enough. So in case you’re late to the party, Priyanka Chopra just got married today to Nick Jonas. Priyanka Chopra’s First Wedding Pictures are finally out, and in all honesty, it is the prettiest colours, outfits, and looks you will see today. I mean no offence, Deepika and Ranveer had a fantastic wedding. But some of their wedding outfit choices clearly went over my fashion sense. They looked gorgeous, no doubt and I bet we didn’t expect to see so much of outfit drama. In case of Priyanka Chopra’s first wedding function which was the mehendi, the Hollywood celebrity looked drop dead gorgeous in a colourful Abu Jani Sandeep Khosla lehenga. I think it was the perfect pick for a fun, playful, outdoorsy day time mehendi party. Not just the bride, but her entire squad looked like they had the time of their lives. That drama in that gorgeous colourful lehenga is absolutely sensational. First glance at this picture, and it just took my breath away. Priyanka Chopra looks so beautiful, happy jolly bride to be. The love on her face is hard to miss, and from the looks of it, she had a blast at her first official wedding party. The lehenga itself has 48 Kallis and is a folksy, multihued organdie ensemble teamed with heirloom jewellery from Abu Jani Sandeep Khosla. The wedding itself is conceptualised, and designed by the designer. If you remember, Deepika and Ranveer’s entire wedding was designed by Sabyasachi. So I guess this is the newest thing in B Town weddings. To get designers to do more that just make bridal and groom outfits. Although we didn’t get to see too much of the wedding venue or the decor, there were some pictures of Umaid Bhawan’s exterior lightings etc, and it look fabulous. Is anybody else also getting the desi girl song playing in their head seeing this look? PeeCee looked sensational in a all gold silver glittery sequins Abu Jani Sandeep Khosla saree. She looked every bit of a blushing bride next to her hubby Nick Jonas. They also shared a beautiful short video of their sangeet night showing everyone from the groom, bride, brides mother and the entourage dancing the night away. In case, you missed it. Here’s all the photos and videos. What do you think? Today the couple will share photos from their wedding ceremony and I bet, PeeCee is going to rock the wedding. Stay tuned for all the updates and photos+videos right here in this post. I love that our wedding was a religious mash-up. We took beautiful traditions that we both grew up with and personalized them in a way that made sense for us. It’s been incredible to find the commonalities between our beliefs and figuring out how to blend them in a respectful and meaningful way. Have we seen this Sabyasachi lehenga somewhere? I think we have. Haven’t we? I am sure it is custom-custom somewhere, but more or less this lehenga is not like never seen before kinds. But you know what. I love this. Its basic red, nothing too dramatic, over the top, and my eyes are on the bride as opposed to ogling at her wedding lehenga. The groom on the other hand, also opted for a simple gold sherwani for his Hindu wedding nuptials. Priyanka Chopra a gorgeous rani haar (is it a rani haar?) with her red Sabyasachi lehenga. While in the official pictures, we didn’t get a close up look of all the details in her wedding jewellery. Sabyasachi just released a picture of the same jewellery set and here’s what he has to say about it. The unfortunate part about this wedding is that she sold all her wedding photos and videos rights to Peoples magazine. I mean seriously PeeCee, I feel a tad bit betrayed. All these blurry images that you will see below this picture just makes my heart cringe a bit. I mean why. Such a beautiful wedding, and now we have to buy the magazine to be a part of it. Unfair. What do you think? So only for you, I managed to dig out *one* high resolution picture of Priyanka Chopra Nick Jonas from their Christian Wedding ceremony. We all want to see a close up look at that gorgeous wedding gown, and this is probably the only picture you will get to see which will not make you get your eyes glued to the screen looking for details. Apparently, Ralph Lauren has only designed two other wedding dresses before this one. In the interview to People’s magazine, PeeCee explains why her wedding dress is super special coming from the designer’s powerhouse. Chopra wore a hand-beaded and hand-embroidered dress featuring floral and scroll motifs, lace-effect tulle appliqués, scalloped sleeves and a high-neck collar. Ralph Lauren also outfitted the entire wedding party — 12 bridesmaids, 12 groomsmen, four flower girls and one ring bearer — as well as the bride and groom’s parents. 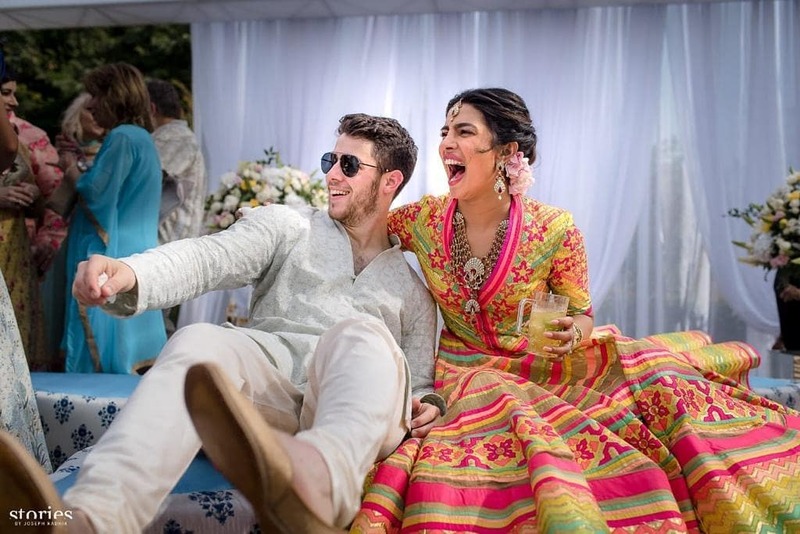 The bride also wanted to honor the people, morals and moments that are closest to her so the team at Ralph Lauren hand-stitched eight words and phrases on to the gown including Jonas’ full name (Nicholas Jerry Jonas), the couple’s wedding date and the names of her parents (Madhu & Ashok). To add to the familial sentiment behind her design, Chopra had a piece of her mother-in-law’s lace wedding dress sewn into her dress. I am not entirely sure of what I feel about the see through wedding dress. But it is quite dreamy for sure. The high neck, and that long train behind. Very subtle yet dramatic. Definitely scores way higher than DeepVeers wedding looks. Which celebrity wedding look did you enjoy the most this season? Nice wedding photos of priyanka chopra. Priyanka’s frock attracting .